IC card - RFID | Nagase Techno Service CO., LTD. 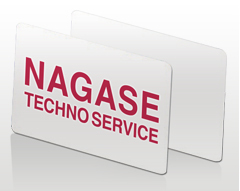 The specialities from Nagase Techno Service are ultimately thin & flat inlay or card over the world as well as cost effective service. World class of printing quality is available with economical costs. Laminating ThermoRewrite Leuco film, you can print and erase your information or advertisement on your card. Ultimately flat pre-lam or end-lam makes your card printing quality to be the best over the world. © 2019 NAGASE TECHNO SERVICE CO., LTD.